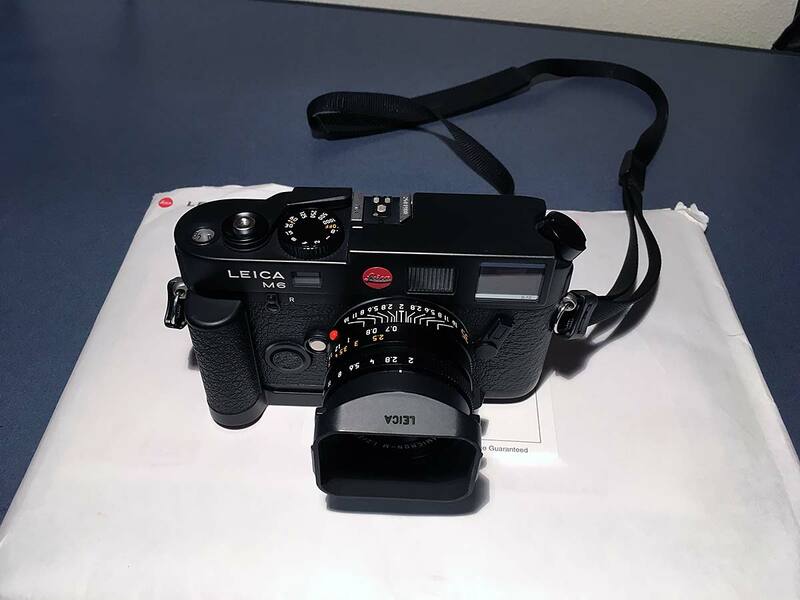 I had my summicron v4 serviced by leica last year, but i noticed that the front of the lens spins off center. Will this impact focus? I read on RFF that it is a common problem, but i dont know if it will impact focus or not. if it does, will aligning the white dot on the front of the lens with the rear of the lens dead center correct it? Is there any DIY fix for this? Just bumping to see if someone has any input. Mine does this. It's common I believe. Don't twist it. Does the lens not being lined up impact the focus at all? Mine is also twisted and doesn't focus very well. I'm going to send it for service some day. When you focus yours, do you align the white dots at the front and rear of the lens? Wow, referencing the image you've included, if the alignment of the lens hood matches that of the front of your lens (the dot on the lens hood lines up with the dot on the lens) then the components of your lens appear to be off by a very large margin. I must admit that it would bother me regardless of any impact it might have on the resulting images. 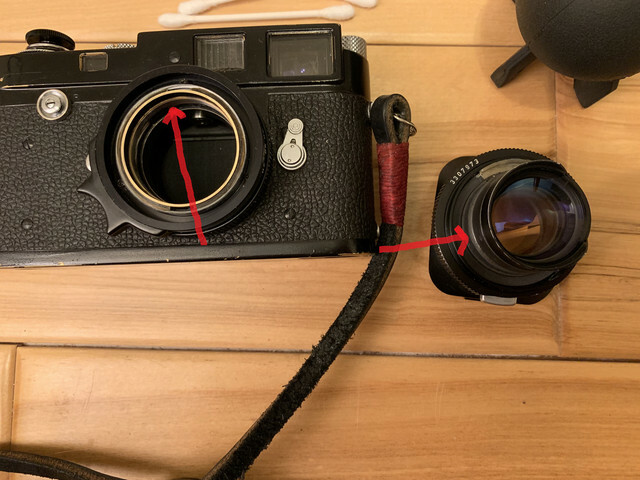 I suppose it's possible that Leica has some sort of alignment tolerance that they find acceptable for lens assembly, but your situation looks quite extreme. If you move your aperture ring from one extreme to the other (f2 or f16) does the number align with the front dot? My Summicron is a later version but overall things look the same from a functional standpoint. I only use the dot on the front of the lens as a reference for my aperture setting. 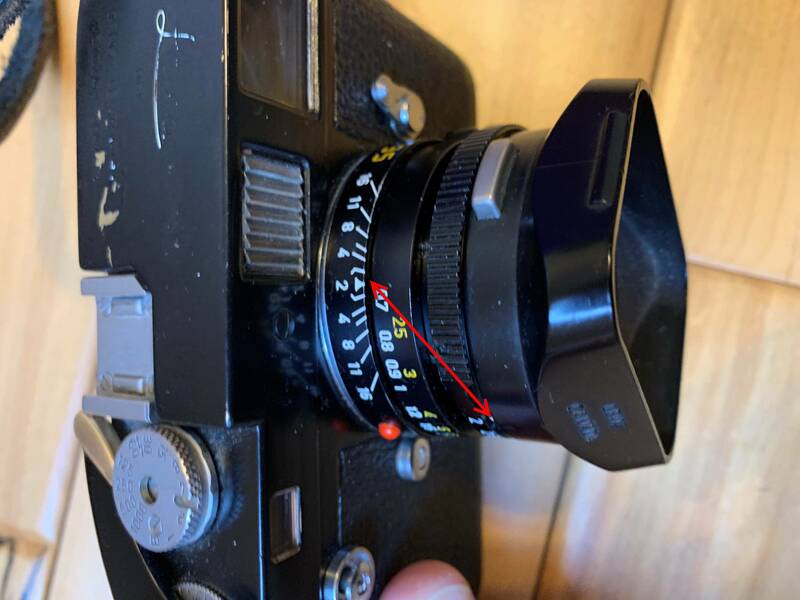 For focusing I'm either referencing the back of the lens using the depth of field scale as it relates to the focusing ring itself or I'm visually referencing the rangefinder patch in the viewfinder. In this photo of my camera the dot you see at the front of the lens is actually the dot on the lens hood which covers the dot on the front of the lens itself. The lens hood has a tiny bit of play in it once mounted to the lens, but the lens itself is solid and the aperture reference dot does not move at all in relationship to the lens mount. This video takes apart the front end of the lens. It might offer some clues to the problem. Thanks for all of the feedback. That youtube link does not work. 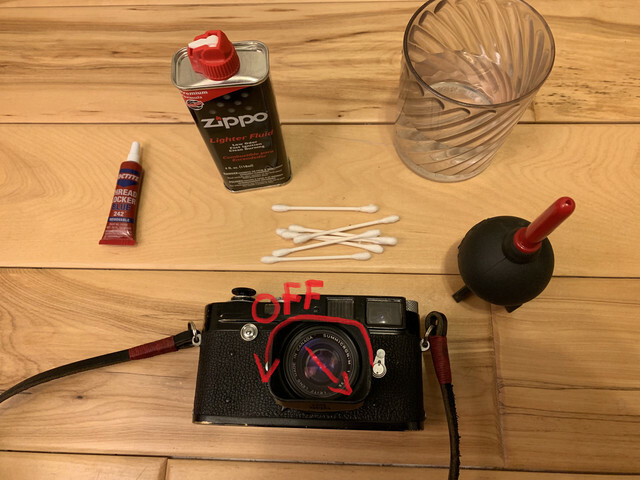 I came to the conclusion that my first image didn't explain enough of what I am seeing, but some of you are familar with the issue of the glue breaking so the front of the lens comes loose. That is what I think I am dealing with. I think the lens should basically look like the top two pictures, although I can rotate the front as far as pics 3 & 4. As I rotate, the front of the lens doesn't seem to move in an out, so the space in the red box in the last image stays consistent. So my question is, as aesthetically unpleasing as this is, will this impact my focus? If you rotate the front of the lens like you mentioned can you see any glass moving forward / backward or rotating in place? 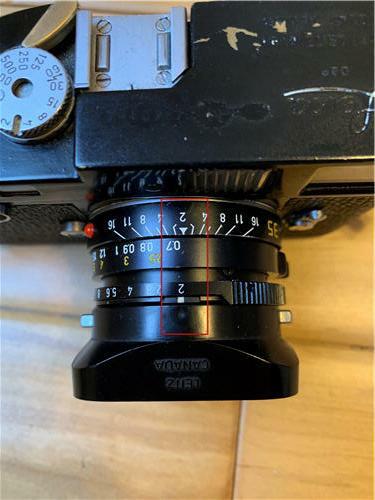 The lens elements in the v4 35mm lens are mounted in an optical group, with the front lens hood / filter mount, which has a very fine pitch composite / plastic thread on the outside that screws into the focussing mount / body of the lens. 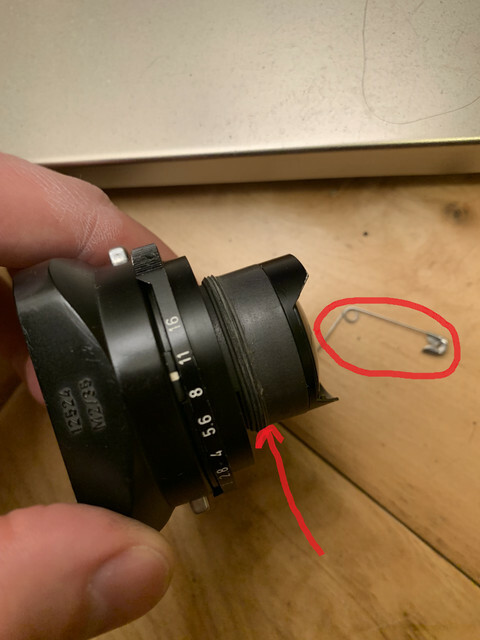 This group is held in position by a small amount of threadlocker and, I believe, a couple of small grub screws, but it can come adrift if the rectangular lens hood takes a knock on one of the corners. If the optical group does turn it is effectively starting to unscrew. 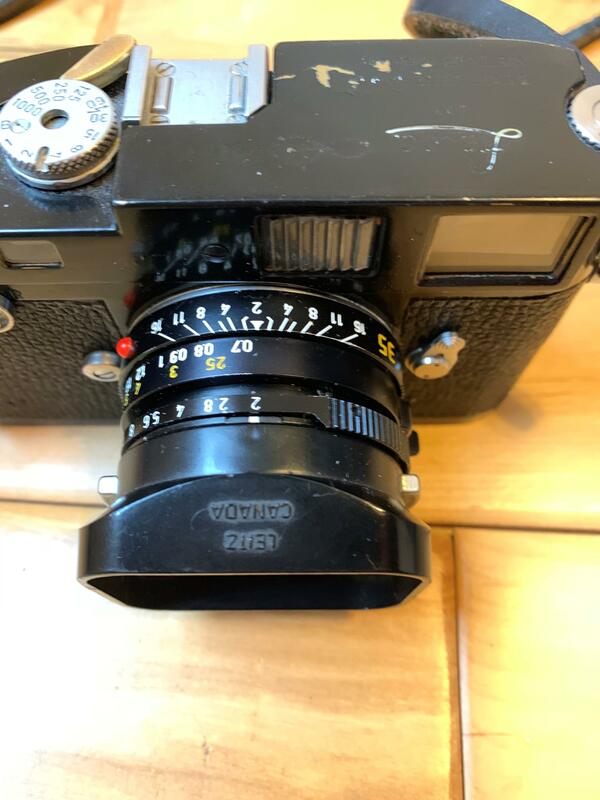 It may not be obvious due to the fineness of the above thread pitch, but it is actually moving the lens slightly further from the film plane and so shifting focus slightly from what the rangefinder cam is showing. I've had the same problem with my v4. 35mm for a number of years and so now use one of the round 12585 hoods with this lens as it has no corners to catch, and so is less likely to cause the front section to rotate. 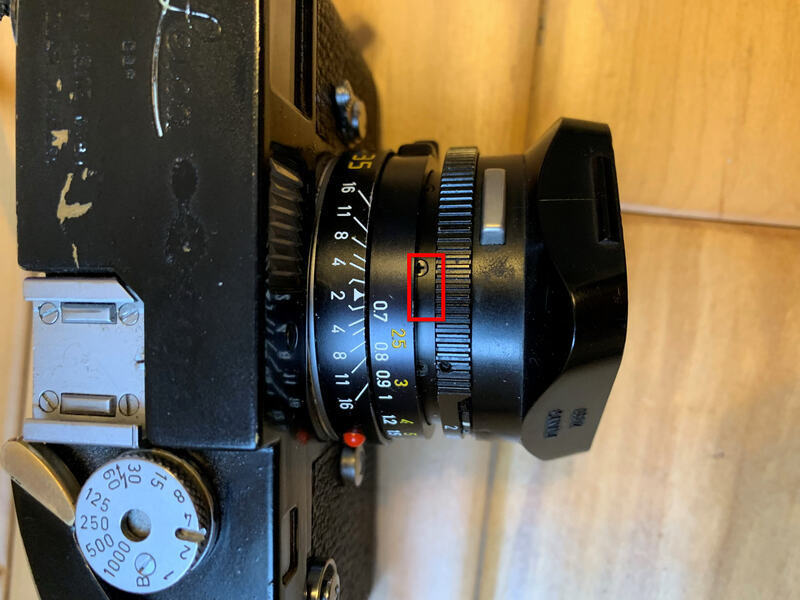 If, for whatever reason, the front group does turn slightly then I just carefully move it back into position so that the aperture mark lines up again with the focus index mark. 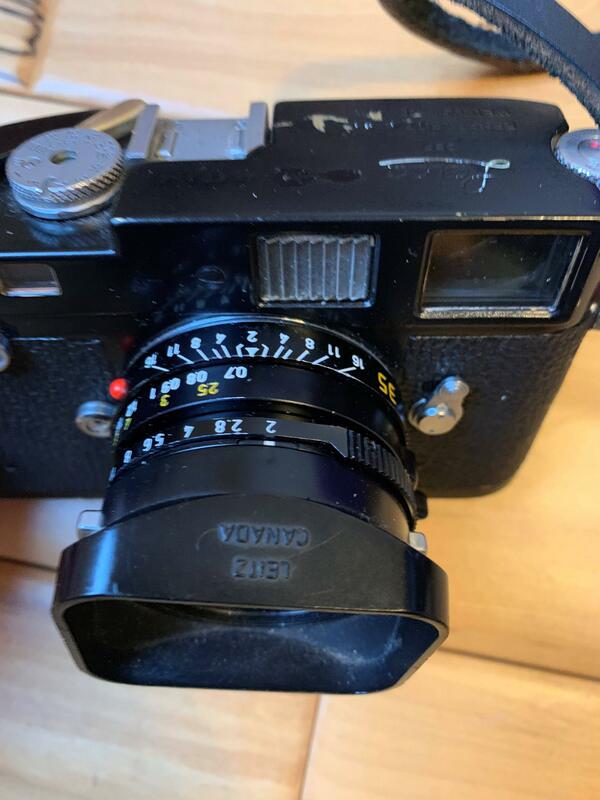 I am probably going to be putting the lens in for servicing at some point in order to get a six bit mount fitted, and get the focus cam checked for digital, but it isnt currently enough of an issue for me right now. Thanks DC - so just to confirm, you're saying as long as i realign the aperture dot in front with the focus index one in the rear each time I shoot, I should more or less be okay? It doesn't seem to have caused any issues, but if it was me I would probably refrain from rotating your lens intentionally unless you can avoid it. Easy apart, easy fix. I just used blue locktite on the threads and lined it up. Never had a problem after. Thanks Mike. I sent you a PM. If you provide some guidance I am going to attempt the repair, and if I do, I will document and post a guide here for others who have this issue. Okay, as promised, I put together a little guide to hopefully help people that have this issue. Some piece of paper to assist in - alignment see last pic - i used a CD sleeve. A note before starting this: be ****ing careful about the rear element of the lens and put a filter on the front. Also be careful with the loctite, it comes out FAST and you don't want it anywhere where it doesn't belong. Use some on a towel first to see how fast it comes out. Start by laying everything out with good lighting. You'll need to twist the lens off in the direction of the arrow, which is counter clockwise, so lefty loosey. An observation I made was about 2 1/2 turns on the word "Canada" got the lens out from the focusing body. The word "Canada" was about where the arrow goes to when i could pull up on the lens. Twist off the lens from the focusing body. This is what it looks like apart, I was told there is a factory used adhesive here, so we need to clean it out. I put some zippo fluid on a QTip and went around both threads that have arrows pointing to them. I then used a pin to scrape more of it out until i felt like i hit metal. Here is mid cleaning of the lens threads. You can see the pin I used. I stopped and blew with missile thing and redid zippo periodically. At the end I used a wet with water QTip and hit the threads then dried with other end, all the way around. This might get gunk and clear zippo fluid. Make sure you're ready and apply loctite to the threads in this pic and twist lens back into body. 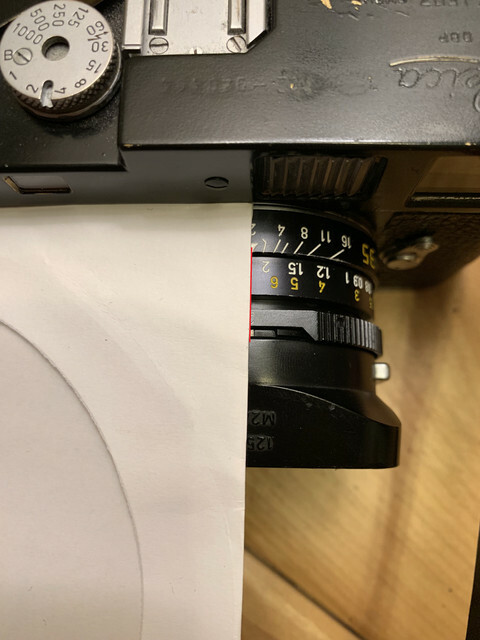 Align with your eye and tweak with the paper, I held mine to the body to get straight and then put it in the center of the scale in the rear triangle thing and matched it with the front of the lens.